Vehicle manufacturers (VMs) are driven by the need to reduce the weight of the vehicles they produce, which, in tandem with improved aerodynamics and low rolling resistance, allows them to reduce the emissions they emit and the fuel they consume. Many new models are now managing to return savings up to 40kg, mainly through the use of lighter materials and this includes their steering and suspension components, where the use of aluminium and hybrid reinforced plastics is growing in popularity. This trend is not just confined to aluminium wishbones and arms, but now even extends to components such as tie rod ends, which since 2016 have been used on the Renault Mégane, for example. Although individually not a huge saving, as each is only 250grams lighter than the previous part, there are of course, two per vehicle and so combined with similar savings from suspension arms and stabiliser links and-the-like, the weight savings soon add up. Although VMs are also moving towards solid rear axles, this time for cost reduction reasons, there has been an increase in the use of multilink/independent rear suspension and some of the most popular arms are now therefore, rear track rod arms. Generally speaking these are relatively simple in design and employ bushes rather than ball joints. However, these bushes often cannot be replaced because they are either not available separately or it is not practical/cost effective to replace them, which means the whole arm has to be renewed. Another development that has affected the aftermarket concerns the nuts that are required for these components, not just those included in fitting kits, but the ones used for numerous arms and tie rod ends, that are now explicitly specified for the application or are designed for single use and once removed, should therefore be discarded. Many of these nuts are of unique design and some come with steel inserts, making them a far cry from their standard, Nyloc equivalents. In fact, some cannot be successfully removed at all and need to be sawn off. 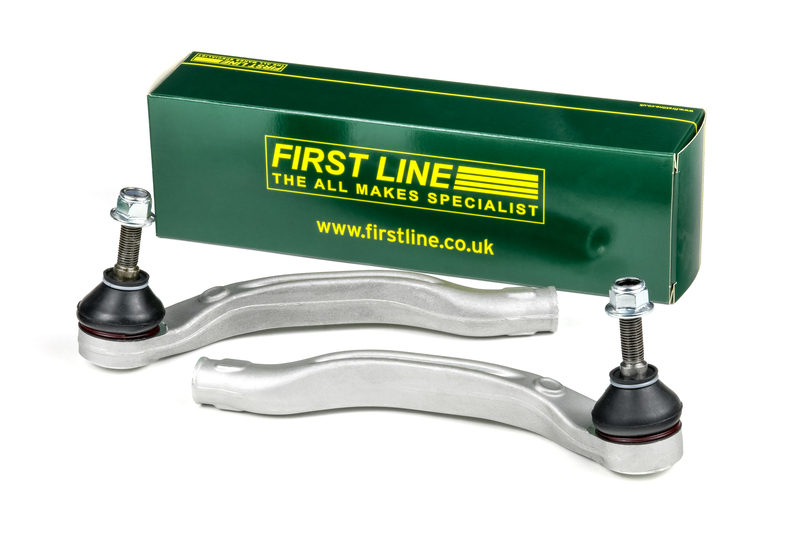 Irrespective of the material used or their individual design, workshops can rely on the replacement steering and suspension components supplied by First Line, which will always be a direct replacement with the original component and therefore reflect the materials used for each application, to provide technicians with the premium quality part they need when changing these safety critical items. Plus, when it comes to First Line/Borg & Beck’s wishbones, stabiliser links and ball joints, all the necessary fittings, such as the nuts and bolts, are supplied as standard. That way technicians can be assured that they will have everything they need to complete the job, without having to pay any extra. As a leading supplier in the steering and suspension sector, the company is always among the first with new-to-range additions and naturally many of these new products will be of the most up-to-date design, including the aforementioned Renault Megane Aluminium Tie Rod Ends FTR5998/9. Other notable new-to-range references include the suspension arms to fit the Vauxhall/Opel Astra VII/K 2015> FCA7576/7, and the top strut mounting to fit multiple VAG applications including A3, Leon, Golf and Octavia 2012> FSM5485.